I’ll be presenting 3 writing and illustration workshops at this years 2019 Young Writer’s Conference. Workshops will be provided for grades K-2, 3-5 and 6-8. Events are held at Southwest Minnesota State University. I’ll be signing copies of Where Are All the Minnesotans? at this years Warden House Museum Holiday event! Come enjoy a truly unique holiday shopping experience at the Historic Warden’s House Museum while meeting local authors, sipping coffee, and enjoying live holiday songs at our annual open house and book sale. Part of the month-long traditional Hometown for the Holidays celebration in historic Stillwater! I’m looking forward to presenting at the North Shore Illustrator’s Gathering up in Grand Marais, MN in November. The conference is full of great speakers, classes and panel discussions. I’ll be presenting an illustration lecture and teaching a 3 hour class on illustrating a picture book. I’ll be presenting 3 workshops at this years 2018 Young Artists conference for ages K-8th grade! I’m looking forward to it. Presentations and workshops for grades 1-8 involving writing and illustrating your own stories. 3 workshops I’ll present on Writing and Illustrating stories. Join Karlyn Coleman and I sharing "Where Are All the Minnesotans". Karlyn Coleman and I will be signing copies of "Where Are All the Minnesotans?" at the Minnesota Historical Society. Address: 345 W. Kellogg Blvd. Join me at 12:00 noon, December 2nd at the Barnes and Noble Book Fair at the Roseville store in Har Mar. I'll be discussing what it is like to illustrate a children's book. I'll have process and early drawings and original artwork. I am so excited for the release of my newest picture book, "Where Are All the Minnesotans? ", written by Karlyn Coleman and published by the Minnesota Historical Society Press. (Insert cheers here) . It is a delightfully written story about Minnesotans and the winter season. Join Karlyn and I for the official book launch party at the marvelous Red Balloon Bookstore in St. Paul. The event starts at 10:30am. Arrive early to snag a seat as these events fill up. Karlyn will read the book and I'll talk about creating the artwork. I'll also be bringing some of the original artwork. What is better than, books, refreshments and fun? See you there. Guest Speaker and presenter at the 2017 Young Artist's Conference. I'll be working with Grades K-2, 3-5, 6-8, on a session called, Drawing a Picture Book Moment. Can't wait! 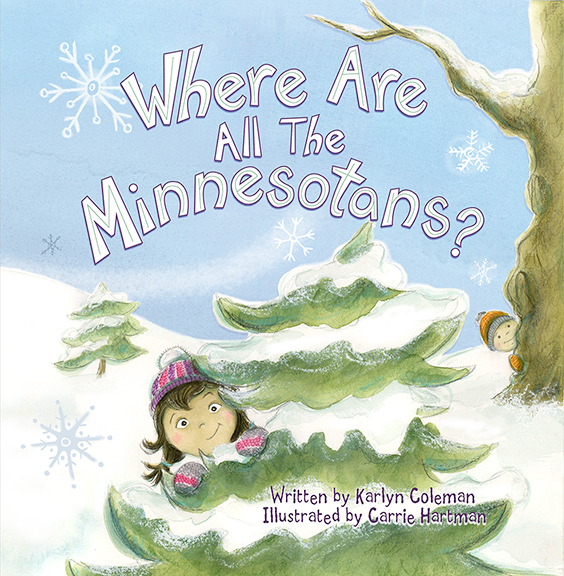 Join Karlyn Coleman (author) and Carrie Hartman (illustrator) as they read there new book, "Where Are All the Minnesotans?" along with other titles. We'll be on the Storytime Trolley in Stillwater at 10:30am. I will be attending the 2017 MN SCBWI (Society of Children's Book Writers and Illustrators) conference at the University of Minnesota, St. Paul Campus. I am the 2017-2018 Illustration Mentor for the MN SCBWI. I am so pleased to announce that I will be mentoring, illustrator Betsy LePlatt. She is the winner of the free, 1 year mentorship. I look forward to working with Betsy, getting to know her and her work and helping her with her professional career. Congrats, Betsy.